Enough serious business. We have to talk about Sarah Jessica Parker. What was she thinking? Buying herself some new babies with Matthew Broderick as the daddy? Broderick has been sliming his way around Manhattan. I haven't forgiven him yet. Links fixed. Sorry. More commentary in the comments. 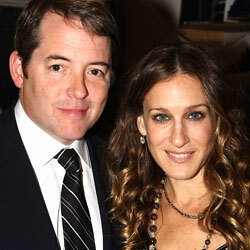 This is the URL you put in: http://http//nymag.com/daily/intel/2009/04/sjp_and_matthew_broderick_gin.html – you’ve doubled your http, and it doesn’t work. She’s thinking that she’s been doing IVF since her mid-thirties and she is committed to siblings for her son. She’s thinking that she’s not the first person who’s marriage has floundered on the rocks of infertility, but she’s in too deep to stop now. And she’s thinking that surrogacy (and donor eggs, although I’m sure we’ll never get any confirmation on that one) are going to help her create the family for which she’s made all the sacrifices of money, time, and mental health over the past 8-10 years. As a former infertile myself, someone who knows people who chose donor gametes and surrogacy, I have some sense of what it cost Parker and Broderick to reach this point. I don’t recall anyone saying that Joan Lunden “bought” her babies, nor Kelsey Grammar and his second wife (who used their embryos with a gestational surrogate after multiple miscarriages). You could just as easily say that I bought mine, given the costs involved in our treatment. Thanks, dave s., I fixed them. This story and Madonna’s rejected adoption has been kicking around my facebook friends. A couple of friends couldn’t conceive w/IVF and have been on the lists for adoptions for babies from China. They have been denied, because China isn’t letting Westerns adopt anymore. My friends are very bitter, because they say that only the very rich have options now. SJP and MB can do the surrogate mother thing for hundreds of thousands of dollars. And they can do that without worrying about whether the father will remain in the picture in the future. Or they can buy off foreign countries like Jolie. There’s a lot of bitterness out there right now. On a side note, my brother was almost Broderick’s stand-in when they were filming Election. The face doesn’t really match, but the hair is dead-on. Apparently, they are the same size. He says he would have got it, but they never told him not to get a haircut. There is actually a thriving special needs adoption program out of China at the moment. We adopted our amazing daughter through this program last year. Big hugs, B mama, for adopting a special needs kid. I have been quietly annoyed at my adoption-thwarted friends who have refused to consider inner-city Americans, children from Russia w/FAS, or special needs kids anywhere. My kid was born with a very mild cleft lip and palate. A surgery or two and a little speech therapy. No biggie, really truly. We are the lucky ones to get to parent this awesome kiddo. Why has China shut down its adoption program? And I cannot criticize those who draw their line at adopting special-needs kids. I think how you expand your family is one of those big things that ones opinion, if one has one, should be very very quiet. Honestly, if a family doesn’t want to adopt a special needs kid, or one from the inner city, or one with FAS, or one of another race, no one, especially the kid, is well served by encouraging them to do so. China has not entirely shut down their IA program. What they have done is tighten the eligibility restrictions and dramatically reduce the number of children available for non-special-needs adoptions. People beginning the process now can expect to wait four years for a child in the non-special-needs program. For a variety of reasons, I’m not really comfortable grouping adoption (domestic or international) into a conversation about infertility treatment. But, Laura, do you know why your friends aren’t pursuing domestic infant adoption? Everyone I know who’s been willing to adopt transracially has been able to do so, in far less time than is currently the case via China (i.e., 12-18 months), and the federal income tax credit has made those adoptions entirely affordable. I do NOT subscribe to the “just adopt” philosophy but you presented this as the plight of people who can’t afford to become parents via any route, and my curiosity is piqued. FWIW, I believe ART should be covered by insurance, so that money is not the first barrier to assisted reproduction. As a bonus, insurance coverage of IVF would result in greater oversight, in particular regulation on the number of embryos transferred in each cycle. Parker and Broderick may also both hope that, having reached a successful end to their brutal IVF journey, they may now be able to salvage what is, after all, a long marriage that already involves a child. I’m no expert on adoption policies by any measure. I’m just hearing things through the grape vine. I know two couples who have tried to adopt from a non-special needs kid China and have been completely unsuccessful. We had a shower for a friend of mine three years ago, after she had been on a waiting list for two years. No baby. The poor friend has a house with a fully decked out babyroom and no baby. They spent tens of thousands to get the paperwork done and have entirely given up. The other couple has given up, too. I believe that nationalism is causing China to stop international adoptions. I’ve heard that this is an issue world-wide. Again, not an expert on this issue, but I do think it’s interesting. And totally agree, bj. Silence is the best policy when dealing with friends’ family-planning decisions. Actually, the biggest WTF in the celebrity world goes to Rihanna who is staying the guy who beat her up. Actually, Rhianna is not with Chris Brown. I saw in on yahoo yesterday. Rhianna’s father said it is over and done with. Also, this celebrity speculation always creeps me out. I’m guilty of it myself, but just like my neighbor’s marriage, I don’t think we can assume that we really know what goes on in anyone else’s marriage. Maybe he came back contrite. Maybe he didn’t cheat at all. Maybe they have an open marriage. And people “buy” babies every day. I paid a fee to my the adoption agency and to the hospital when we adopted our daughter. I also paid for my next two children’s births. Unless, you have a homebirth with no outside medical help, we all pay something to become parents. I have friends who have one Chinese daughter but are in limbo trying to adopt a sister for her. It’s been tough for them. Interesting recent article from Time magazine about the tighter restrictions in China on overseas adoptions. The story posits that there’s been a cultural and an economic shift in China: Domestic adoption is becoming both more accepted and (as the country’s standard of living rises) more affordable there. I read somewhere else (can’t remember where) that China felt it was becoming known as “the world’s baby broker” and was uncomfortable with that reputation. Friends of mine have adopted from Guatemala and from Ethiopia. In all 3 cases (2 from Guatemala), the children were at least 2 years old, and one of the children from Guatemala had health problems (a digestive system parasite of some sort, I think). All thriving now. She used to often personally drop off her tiny toddler at a nearby nursery school program and then hang in a coffee shop until pick up. (Admittedly, a nanny probably did it sometimes, too.) If this recurs in few years, youngsters probably won’t be as thrilled to see her, as her fame seems to be gradually fading. I am a bit uncomfortable (as someone else also stated) with linking adoption and infertility together. Adoption is not and should not be seen as a “fix” for infertility. Adoption should be finding families for children who need a family. The wait-times for adopting from China have gone up considerably in the last 4 years. Fewer non-special needs children are available & eligible due to a variety of factors: increased wealth in China means that more families can pay the fine for “over limit” children, increased pollution in China has reduced the number of non special needs children in general, increased infertility (due to pollution and other factors) as well as increased acceptance of domestic adoption has meant that more children are being adopted domestically in China, and with the signing of the Hague Treaty on Inter-country Adoption…international adoption is now much lower on the totem poll of how children are placed. The Hague Treaty (of which the US is also a signatory) states very clearly that the goal is to support birth families in keeping their children, barring that, promoting kinship adoption, barring that – promoting domestic adoption and only as a last resort – promoting international adoption. As someone very involved in the adoption community for a number of years – I can only applaud the stated goals of the Hague Convention. I think most people would be hard pressed to argue against those goals if the best interest of the child is truly what they are concerned about. China has actually been fairly clear since late 2006 that wait times had been increasing and would continue to increase. Sadly, many families refused to believe the evidence before their eyes. Currently, families who have waited slightly over 3 years are receiving their referrals from the non specials needs program from China. It has not stopped, but is drastically reduced. I am sorry that your friends weren’t successful in building their family the way they planned. However, I would also take issue with the idea that they spent “tens of thousands of dollars” getting their paperwork together to apply to adopt. I have gone through the non special needs process, and we spent approximately 20,000 TOTAL (including travel to/from China, fees in both countries, a 2 week stay in China, and re-adoption in our home state upon our return. Over $10,000 of that money was spent on the travel portion and legal fees within China. While I don’t doubt your friends did spend several thousands of dollars on the paperchasing process – I also think we really need to make sure in conversations about adoption that we are clear that the money spent was not to “buy” a child (nor does that money spent entitle one to a child) but rather it is spent to fulfill the application costs. The adoption agency, the immigration paperwork, the homestudy done to ensure that people are miminally qualified to adopt a child, etc. Your friends paid for those services – they received those services. The wait times were never guaranteed, nor was a child after the application was reviewed. There are so many misconceptions regarding adoption (both domestic and international) and I think this is a topic where those who admittedly know little should tread lightly when speaking to it, as children are intimately affected by the erroneous comments and conclusions many come to. And no parent wants to be commended on adoption their child (non special need or special need). The vast majority of people who adopt wanted to be parents. They choose the program that works best for them and their family. I know you have talked about your children’s special needs from time to time on this blog. Think about how you would feel if someone wrote to give you “Big Hugs” for choosing to parent your son with special needs. Would you feel complimented? Or would you wonder why someone felt the need to give “Big Hugs” for you doing your job as a parent? I say all these things because I think you are an incredibly thoughtful blogger and mother (from what I read on this blog). I hope you can hear what I have said and understand why I chose to say it. And I will also hope that you investigate further into adoption if you are interested in talking about it in the future, as it is a complex, fascinating, frustrating, rewarding topic that is all too often used as a stereotype or holding place in conversations surrounding infertility, family building and parenting. Thanks for your thoughtful and illuminating comment, chicagomama. Please never hesitate to disagree with me on my blog. I like debate. I am sensitive about that the fact that so many children with special needs are not adopted. From time to time, I think about what happens to kids like my son who are born without family. They remain in institutions without the hope of adoption for their entire lives. Rare families adopt special needs kids, and I admire them for it. I admire parents who have biological children with special needs and love them and care for them in sometimes very difficult circumstances. I give them big hugs all the time. My burden has been very light comparatively. Really. But I also like to get big hugs for the surviving the tough years.